Not everyone LIKES night shift, but all of us can survive it and many (if not most) of us have to work it at one time or another. Here's how to survive. You are reading page 3 of Night Shift For Newbies. If you want to start from the beginning Go to First Page. Because of working the night shift, my friends and family never know when to call me, so they don't - great, but then all of a sudden they would call me in a panic because, "Oh yeah, I couldn't get a hold of you so I planned this for you and its today." The other thing I deal with is me answering the phone without being awake.... I always get feed back the next day, "You answered, but you sounded super groggy but you said we were okay to keep talking!" Really!? Hang up!! silverbat has 22 years experience and works as a Care Coordination. I worked nights for 15 years, and loved them!!! If I could do my current job at night, I would!! My schedule was.. work 12 hr night, get home about 8 am, and right to bed after toast and an egg, etc.,, then sleep until 4pm, then up, make supper for me and hubby, eat, off to work at 5 30, ( worked 7-7, but had 45 min commute). I generally took leftovers or a Lean Cuisine, etc., with fruit or salad to eat at work. When I got home, eat, light, then bed, if I was off that night, I would sleep until noon or 1, then up and to bed with family. The next day, I would get up when I wanted, go to bed when I wanted, and then sleep late the next day until 11 or later :), to be back at work that night. May sund weird, but it worked!! I got curtains that darkened the room, thick blinds, etc., gotta have the loud fan, and turned off the phones. I left the answering machine on in the living room, but I couldn't hear it in my room. Yes, I have taken a nap in a safe area in order to make it home. I have also slept while driving...hummmm I don't reccommend that, though!! Night shift staff are the best!!!! Also, I enjoy not having all the "big-wigs" around all the time!!!! bagladyrn works as a travel nurse - ob. I've been working nights for 28 years now. If you have kids you may want to "enlist" them in helping mom to get her sleep - pointing out that you are a much nicer person to be around when you have enough rest. My boys would screen calls, politely informing callers "I'll be glad to take a message but I won't wake her." The general guideline was only to wake me for spurting blood or bones sticking through the skin. I also instituted a general rule that any permission granted was automatically changed to "No way" if they had asked during sleep hours. On driving home: I've found that a large orange juice sipped along the way seems to help keep me awake. If the open window and radio don't do it, I pull over and walk briskly beside the truck swinging my arms and deep breathing. I have been working nites for 2 years now. I am no spring chicken and I have always been a nite person. My problem is I cannot sleep at nite anymore. Awake and sleepy all day, but go to bed and I am awake all nite. It can be 36 hours before I get to sleep. Needless to say it drives me crazy. Ambien helped until I developed angioedema whenever I took it. Worked last nite (Thursday), came home slept from 10 am till 3 pm.(Fri.) Now it is 4 am (Sat.) and I am still wide awake and I have a full day of activities ahead and company. Hopefully I will sleep tonight after the busy day, if not I will sleep all day Sunday. My body is whacked. My BP is high and I am gaining weight. The sleep problems were not bad when I was young, they seem to come with age Also, our shift differential is not much and the ratio at nite is now up to 7 patients per nurse. Time for a new job I think! frankyfern22 works as a Family Nurse Practitioner-Certified. I don't work nights anymore, but I just want to say that as a fresh new nurse, I think it saved me from running away from nursing altogether and I'm glad I did it. I loved my night shift crew and made some great friendships in a short amount of time I was there. Yes, night shift is busy in its own way, but it was a good environment to learn in and people were actually able to help you and answer questions. My first day shift job was insane! It was a million miles a minute, every single minute of those 12-hours!!! Sleep was tough to get used to but I'd work nights again if I needed to :) Good night! An additional TRIED and TRUE night shift assist= GET A FAN! I am SO about the "background noise" ....it really does help block out neighbors mowing lawns, family in the house showering or just doing stuff, even loud horns honking next door, and little ones playing outside! For awhile I did wear ear plugs too, but don't do that anymore. It wasn't too bad though. I love night shift, it's my preferred shift. The only time I've done days is when a manager tells me I have to do orientation on days "just to know what it's like". Need to remember about the eating well even on nights, it's so easy to binge on junk food. MouseMichelle has 16 years experience and works as a LTC. I used to do full time nights and it was in a very small town of 400 people, needless to say I could do nothing on my days off, and I got very depressed. I now work part time nights, four off and two on. Your article is great. I would add and emphasize about the eating, eat healthy, and don't snack all night to keep yourself awake, you want to stay awake drink water....... most night workers gain weight. Also like you said in your article excercise. I go swimming every morning after my night shift to get rid of my stress and keep my weight under control. As for the sleep that's very important don't consider the day before your night shift as okay I can go have fun you'll regret it. It's also true about your coworkers, yes we have down time, not much I'd say about 45 minutes each night and I love talking to my CNA's and we're good friends which makes for a good work environment because my CNA's respect me as a supervisor and as a friend. However they all know that when I'm directing them about things it's not personal but about the job. It's okay to be friends with your CNA's but you need to keep you boundries in terms of work/vs. friendship. I also wind down after work with my CNA's we sit outside drinking sodas and just talk about life. Also melatonin is a great way to get sleep too I take one about an hour before I need to sleep. e.j_rn_to_be works as a CNA, Registered Nurse(class of '10), New grad RN. .... love, love, love your article Ruby Vee! 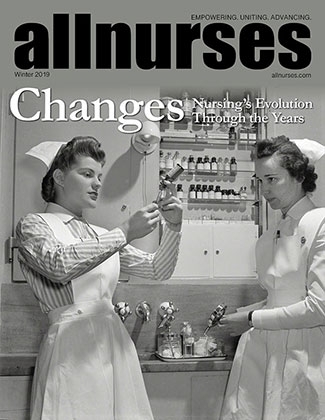 I started on nocs 5-6 weeks ago, and I remember coming over to All Nurses website for some insight and run into your article. Oh, so true about night shifts and such a positive outlook on it! Thank you! I applied many of your insight as well as the other noc shift workers insights as well; staying hydrated, exercising and eating real meals have been helping me understand my body and its circadian rhythm patterns. Hugs! Thank u Whoo for ur helpful tips! I am a LVN of 8 yrs. always worked 7am-3pm on floor only. I would like to try noc's. Would another nurse actually do a discharge for another nurse,I if you never had the experience of doing one? Or do a iv stick for you? I never had to do either! It's scary if you have to do one with no one there to show you how to correctly.